Want to know how to get the perfect blowdry? Getting the perfect blow dry all comes down to the right products and a few key tips. Firstly the most important thing you can do for your hair is to invest in a great shampoo, conditioner and treatment. If your hair is lacking moisture and not in the best condition, its never going to look as good as it can. Then to start your blow dry right a leave in treatment will help smooth your hair and give extra shine. Leave in treatments act like a moisturizer for the hair. They protect your hair from sun, heat and other damage and help your brush to glide through your hair. 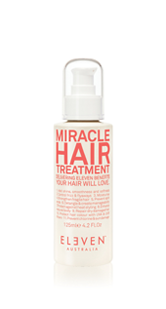 Our fav leave in treatment is Miracle Hair treatment by Eleven. $24.95. Once you’ve prepped your hair with a great leave in, brush through with a detangler. These brushes remove knots without causing breakage in the hair. Hair with less breakage will always look better! These can also be purchased in salon for $18.00. Then you have the option for styling products. Some of our fav are the Volume Foam by Eleven $22.95 or Root Canal by Evo $34.00. It depends if your hair needs body or hold in your blow dry. And for those with curly frizzy hair a smoothing product can assist for a smoother finish. Then invest in a couple of good brushes. Our favorite for blasting the hair is a vent brush. Blast the hair in different directions or tip your head upside down for extra body. I like to dry the hair off to 80% dry before going in with a round brush. Unless you have curly or frizzy hair and in that case you are best to go section by section for a smoother result. Once your hair is almost dry you can go in with a round brush. Everyone is different to what size they need. It depends on the length and thickness of your hair. Start off with a small to medium size. To create a smooth finish, always keep the direction of your nozzle and the hair going downwards and smooth over the brush. If you are trying to create a curl or movement this still applies as you turn the brush rather then go straight down. Once the hair is completely dry, always touch your hair to check. If the hair is not 100% dry it will frizz or loose shape. We then recommend styling with Cloudnine irons to smooth or wave. Only ever use irons that have a heat control on them as regular irons are set to 220 degrees which is way too hot for hair and one of the biggest causes of breakage. Then a touch of hairspray or shine spray, and loosely brush the hair into shape. Our fav is Give me hold Flexible hairspray by Eleven $23.95 and Wella Luxe oil shine spray $29.95. Our go to hairdryer is The Parlux, but any hairdryer that is powerful will do the trick! Volume foam, light but gives your blowdry holod and body! Our fav leave in treatment ever!